Today, we’re introducing the best modular drawer organization system you can find on the market today: Splitplus. Splitplus allows you to organize the inside of drawers in a way that is elegant and completely customized. It is very easy to install and available in a wide variety of measurements and finishes. The best part? This product, which you can import with IBMH today, is primarily characterized by its clean lines and incredibly refined aesthetic. This means that every customer can create multiple combinations that perfectly meet their needs, in terms of both organization and decoration. 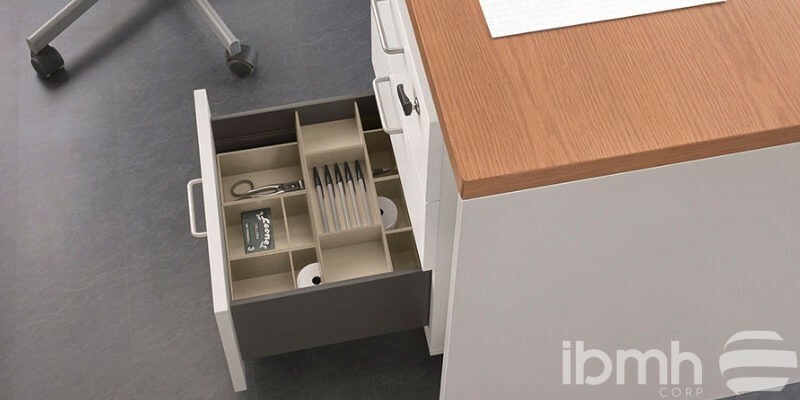 This drawer organization system is beautifully designed and allows for perfect optimization of space, on the cutting edge of organization and aesthetics. Splitplus can be used in double-walled drawers with soft close, in wooden drawers, or in any other type of drawer found in cabinetry and furniture. Splitplus is fully customizable. It is supplied in strips that can be cut and adjusted to the desired measurements. This allows you to easily adapt it to any space you like. Plus, its special supply system offers an additional benefit in terms of logistical cost savings. The volume of this product during transport is minimal. Splitplus can be manufactured in any color, completely custom. With more than 300 possible combinations to choose from. It is also available in numerous finishes. It can be manufactured in a velvety finish or even in natural wood. This adds a very special touch of distinction and elegance to the cabinet in which it is installed as a whole. As you know, at IBMH, through our Sourcing in China service, we are always looking for the best suppliers and products. Splitplus is one of them. What are you waiting for? Contact us today, and we’ll help you incorporate it in your catalogue with guaranteed success!